Granatelli pioneered the adjustable clutch quadrant kit. The double hook quadrant is machined from 6061-T6 aluminum for strength and reliability and the innovative design offers both conventional and quick release cable locators. The easy to turn aluminum firewall clutch adjuster eliminates the factory wimpy plastic unit and rubber bushing at the firewall, works with all clutches, features a unique locking ring to prevent ''cable rewind'' and promises faster, more precise clutch engagement with 55% more adjustment range. 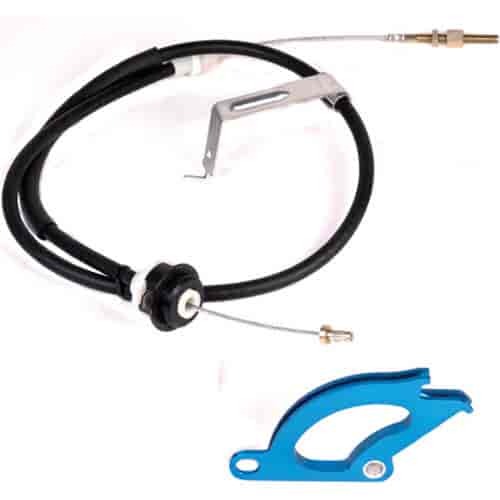 These items are available separately and will interchange with most other aftermarket systems or buy a kit that includes a high-quality cable and all necessary hardware and save time and money. Does Granatelli GMCQ7998 fit your vehicle? GMCQ7998 is rated 5.0 out of 5 by 1.